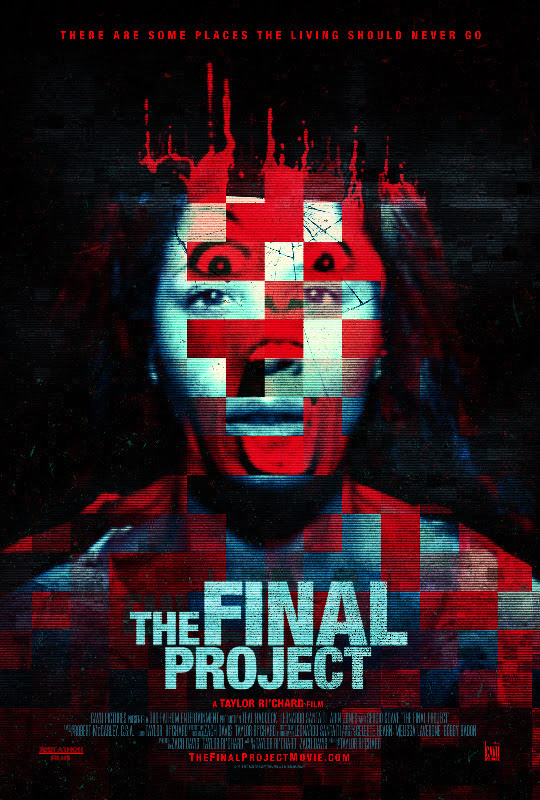 THE FINAL PROJECT is a found footage horror film chronicling what happens when a group of college students decide to make a documentary looking at a supposedly haunted plantation in Louisiana. Warned off by pretty much everyone they still go to the plantation where the group perish and only the footage is left to tell the tale. In a genre rife with films that never explain how or why we are seeing what we are seeing you have to give THE FINAL PROJECT points for explaining what we are seeing and why. It also gets a few more for a couple creepy moments. Unfortunately you have to take a bunch more away for way too slack pacing, Its a mix that makes on one hand makes you want to jump for joy that we have a film that actually takes care at times to rise above the hacks that inhabit the found footage genre but at the same time you really have to wonder why the filmmakers couldn't have tightened it up instead of turning out such a bland, almost dull film. The reason for the blandness comes from the fact that the film, even at running only 80 minutes feels padded. As much as the film avoids many of the pitfalls of the found footage genre, it falls head long in to one of it's biggest traps in that a great deal of the film is material that has no reason to be filmed. Much of the first hour of this film consists of footage that no one would ever have filmed under any circumstances, or if they did no editor worth their salt would have put it in to a film. We get arguments, car rides, classroom conversations and other bits that just don't belong in a found footage film. Why was this filmed? We don't know- or rather because it's the only way to impart information we might need. More importantly the question is who shot a lot of of this? There is no explanation as in GRAVE ENCOUNTERS 2 where there was a character who literally is filming everything he does. Here there is nothing with the result we are left to wonder why they bothered to make this a found footage film when story wise it never should have been. Ideally this could have and should have been a regular narrative with the found footage dropped in. Another problem with the film is that we are almost an hour into the film, two thirds to three quarters of the running time before night falls and things begin to get scary. Why are we watching a film that relies on darkness and night time for things to work- the ghosts are in the shadows- and we only have the night toward the end? Yes things happen before that but it's the odd moment and never sustained until we are deeply into the film, by the time something happens it's much too late to care. I think the reason I'm taking the film to task is that this film almost overcomes the flaws in in the genre to be a really good film. Remember that I find most films currently coming out in the genre lazy and totally unwatchable. Its rare that I find any found footage films that excite me. THE FINAL PROJECT did so in part, but it not on the whole. I truly feel awful because I wanted to like this more. Despite my reservations this isn't a bad film.There is some really good stuff here. The film, when it hits all cylinders, is pretty good, There are several sequences such as the interviews with the towns people and some of the ghostly appearances that make this film far from the vast majority of other films in the genre. I'm calling the film bland not bad. It's not a bad film. Its a film you can watch and enjoy, it's just not going to really scare you, though it does have some really creepy moments. THE FINAL PROJECT in theaters today in Atlanta & Houston (on multiple screens), and then in NY (at the Village East Cinema) & LA on March 4th, followed by a national release.